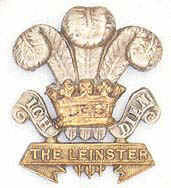 The Leinster Regiment Association on occasion is privileged to participate in events that commemorate the past activities of the Regiment. When we are able, we will make available short video clips for view by our members and the public. You are invited to view these video clips that use the WMV format. The easiest way to view the clip is using Microsoft Windows Media Player. Each page for each video clip has a link that facilitates the downloading of the most recent version of this free program, should you wish to do so. Some video clips are available in a choice of two download speeds, 56K and 512K. If you have a Dial Up modem to access the Internet you should use the 56K link and if you have Broadband access you should use the Broadband link. Available video clips are identified in the navigation panel to the left.